After all of the rain we've had this week, there are wet basements all over the Twin Cities. The most common question we get when it comes to wet basements is "how can I fix it?" While installing drain tile, a sump basket, and a sump pump is nearly a guaranteed way to prevent basement water intrusion, the most important part of preventing basement water intrusion is to control water at the exterior of the home. There are two very basic things that will prevent basement water intrusion in at least 95% of houses: grading and gutters. By the way, I say 95% conservatively. The number is probably closer to 99%. Grading is the first thing to look at if there are water problems at a house. 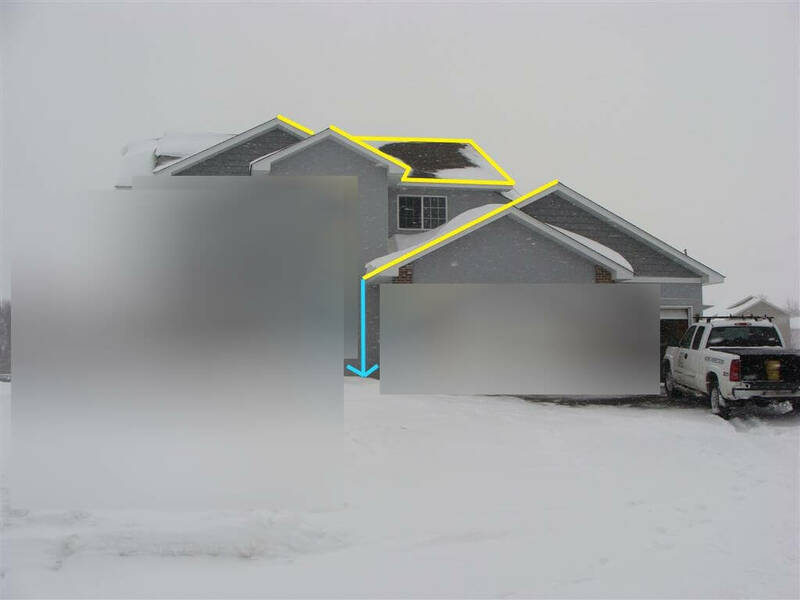 I know this sounds very basic, and it is, but I inspect a ridiculous amount of houses that have poor grading at the exterior. This means that the ground slopes toward the building or allows water to pond next to the building, rather than away. The fix for improper grading is to change the landscaping. Changing the landscaping to get water flowing away from the house is sometimes as easy as bringing in some dirt next to the house and getting the ground to pitch away from the house. The slope of the dirt away from the house doesn't need to be anything dramatic - it just needs to be enough to prevent water from sitting next to the house. Just be careful not to pile the dirt too high against the house, because this could lead to rotting at of the wood framing. Try to keep the grade at least 6" below the top of the foundation wall. In cities like Minneapolis and Saint Paul, houses will often be too close to each other to allow for proper grading. 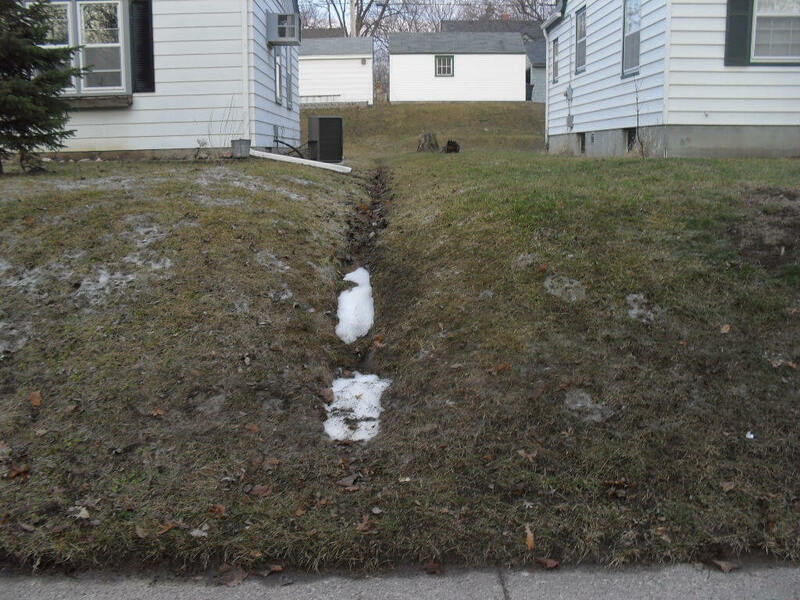 In these cases, one option is to create a swale in the yard, which will allow for water to go around the house in a type of trench. 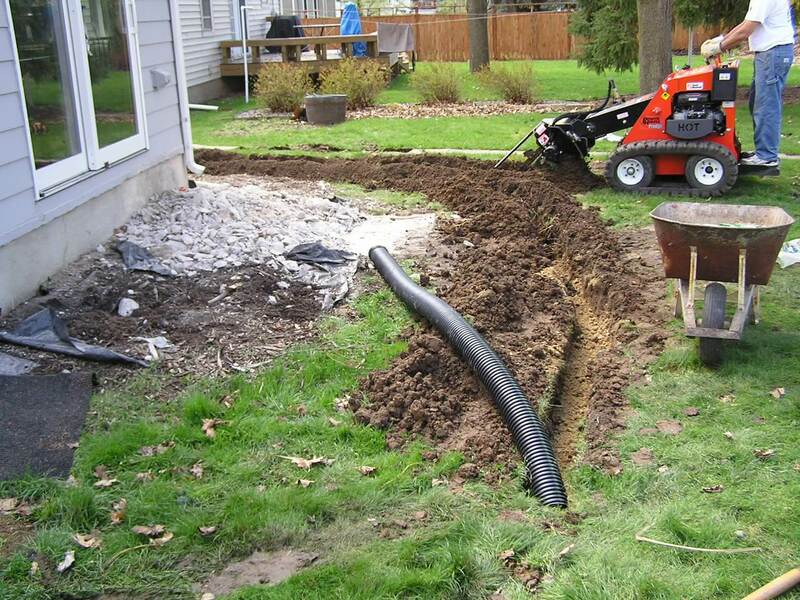 When a swale isn't practical, an underground drain system can be installed in the yard. This system consists of large plastic tubing installed underground that directs surface water to a more desirable location, such as the street. I did this at my last house in Minneapolis many years ago, and it solved my basement water problems. I rented a trenching machine and ending up burying about seventy-five feet of corrugated plastic drain tubing in my yard, and terminated the tubing at the street. Side note: while the trenching machine made it quick and easy to dig the trench, it took all summer to repair the nasty scar left in my yard. I've discovered that a better way to do this is to cut the sod with a flat shovel from underneath and just fold it over for the entire trench length, and use a skinny shovel to dig out the trench. Once you're done, just fold the sod back down. It takes a lot more time and it's a lot more work, but the healing process for the yard is very short. The other basic thing to look at when a house has basement water problems is the gutters and downspouts. Without gutters, rainwater can often be concentrated from many different areas on a roof to one single location next to the house, like what's happening in the photo below. All the highlighted areas dump water in to one single spot next to the house. That's bad news, and in my opinion, bad design. I covered this type of situation in a post last year titled "Have Your Builder Plan For Water Management." Gutters would really help to keep water away from the house here. As I mentioned in the post above, downspouts and downspout extensions are just as important as gutters. I've told many clients that it's better to have NO gutters at all than gutters with improper downspouts. Why? A house with no gutters will typically disperse water along all of the roof lines. 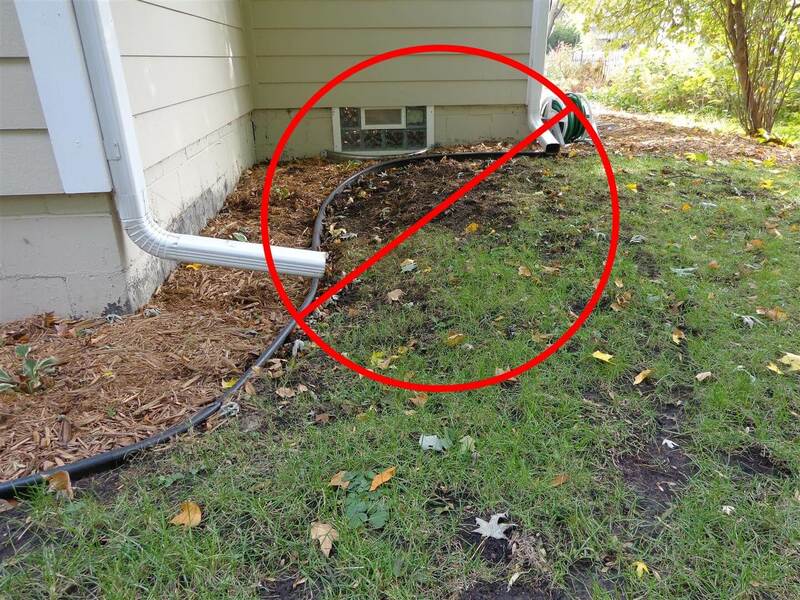 A house with improper downspout extensions will end up concentrating water next to the house. Again, this is bad news. Proper downspout extensions bring water well away from the house - ideally six to ten feet. Of course, gutters need to be cleaned as well. 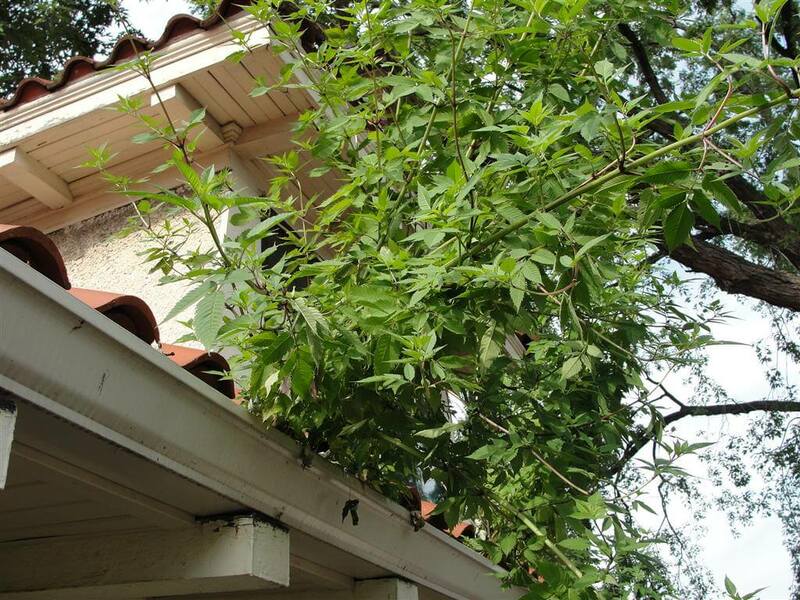 Dirty, overflowing gutters are worse than no gutters at all and can actually cause roof leaks. If you have a properly functioning sump basket and sump pump in your basement, just make sure the system stays functional. 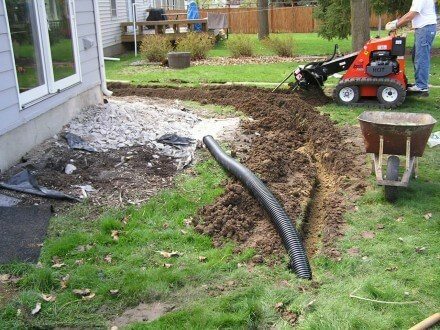 Another home inspector here in Minnesota, Tim Walz, wrote a nice blog post a couple of weeks ago discussing sump pump troubleshooting and failures: http://homeinvestigator.wordpress.com/2014/04/15/is-your-sump-pump-ready-for-spring/ . 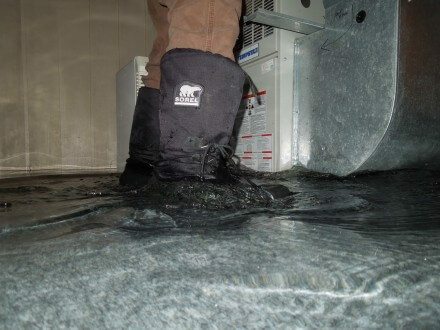 At the end of that post, there's a recommendation for installing a backup sump pump if the system runs all the time, which is certainly a good idea. In fact, it's probably a good idea to have a backup system even if the pump only runs occasionally. Click this link for more information on different sump pump backup systems. If you end up with a wet basement this spring, go outside and take a look at how water is being managed at the exterior. Ideally, take a look while it's raining to make sure the gutters and downspouts aren't leaking, and to make sure that water isn't ponding near the building. If this all looks good and you still get water in your basement, the solution might be to have drain tile installed. If you already have drain tile installed and you're still getting water in your basement, check for cracks in your foundation walls that could be allowing bulk water through the cracks, which basically bypasses the drain tile. Any such cracks should be repaired. If you've checked all this stuff and still can't figure out the cause of basement water problems, the next step would be to contact a basement water specialist. To close, here's a quick news clip that Milind and I did with KSTP News on wet basements in 2011.